Thomas Markle was photographed last week reading the 1990 book "Images of Britain: A Pictorial Journey Through History"
Meghan Markle's father is studying hard ahead of her wedding to Prince Harry...studying about the country where she will live as a member of the Royal family. Thomas Markle, 73, was photographed last week reading the 1990 book "Images of Britain: A Pictorial Journey Through History" while sitting inside a Starbucks in the town of Rosarito Beach on Mexico's Baja California peninsula, where he lives. Inside the book is a section about Windsor Castle, which contains St. George's Chapel, where Meghan, a 36-year-old former "Suits" actress who was born and raised in Los Angeles will marry Harry, 33, next month. The castle is located about 25 miles west of the prince's hometown of London. Meghan's father, a retired Emmy-winning lighting director who worked on shows such as "Married... With Children" and "General Hospital," is divorced from her mother Doria Ragland. The two did, however, issue a joint statement of support for the former actress' engagement to Harry last year. "We are incredibly happy for Meghan and Harry. Our daughter has always been a kind and loving person," they said. "To see her union with Harry, who shares the same qualities, is a source of great joy for us as parents. We wish them a lifetime of happiness," they added, "and are very excited for their future together." Last week, Meghan flew back to Los Angeles to visit her mother and friends. 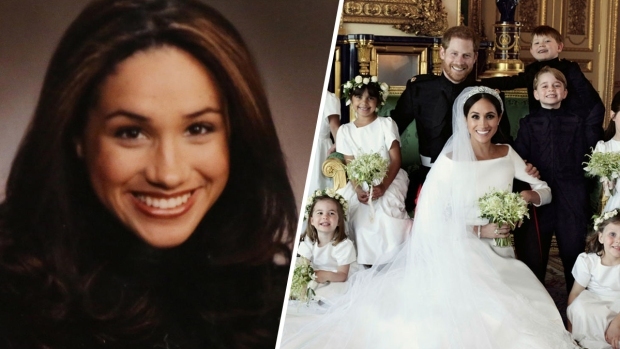 "Meghan is keen to include her mom as much as possible in the wedding plans, so spending time with her was the perfect chance to bring her up to speed on all the wedding details," a source told E! News exclusively. Meghan and Harry's wedding will take place on May 19.